Do your covers come with a warranty? Our Sloped, Flat, and Bubble style window well covers come with a Lifetime Warranty to the original purchaser. Our Warranty does not protect you against: damage caused by alteration, improper installation, improper maintenance, abuse, misuse, or intentional damage. How do I install my covers? Our covers are designed for easy do-it-yourself installation, and only require a drill, a 3/16th” drill bit, and a phillips head screw driver. Each cover comes with step-by-step installation instructions and mounting hardware if necessary. Still need help with installation? If you would like for a trained professional to install your window well cover, window well, or basement window… we recommend Mr. Handyman. Mr. Handyman representatives are home improvement professionals who are licensed, bonded and insured. Their pledge and commitment to their customers is: “On Time. Done Right, Every Time.” Mr. Handyman has been providing outstanding improvements to homes and businesses since 1996. Click Here to locate a Mr. Handyman professional near you or call 1-877-682-6479. Our covers are designed for easy DIY installation in under 30 minutes or less and can easily be installed by anyone who is comfortable using a drill. However, if you would like for a trained professional to install your window well cover, window well, or basement window… we recommend Mr. Handyman. Mr. Handyman representatives are home improvement professionals who are licensed, bonded and insured. Their pledge and commitment to their customers is: “On Time. Done Right, Every Time.” Mr. Handyman has been providing outstanding improvements to homes and businesses since 1996. Click Here to locate a Mr. Handyman professional near you or call 1-877-682-6479. Do your covers come off in case of emergency? All of our covers are designed for easy emergency exit from your basement and “pop off” easily from the inside by pushing up on the window well cover. Safety is our number 1 priority, we make sure each and every cover is Egress Code compliant so that your family is safe. We do offer optional quick-release locks that lock the window well cover in place on your window well, but can easily unlock from the inside by pulling on a pin in case of emergency. See the pin below? Simply pull the pin at all the lock locations and your cover will pop right off for easy emergency exit in under 5 seconds. What sizes do decorative window well liners come in? WindowWellExperts.com can provide up to 60″x 100″ or 60″ x 120″ in most varieties. How do I measure my window wells to order the right size cover? Print off our Measuring Guide that has instructions on how to measure your window well, click here to download the PDF. Once you have your measurements, head on over to the Free Quote page to get a personalized quote! How are the covers removable and if I want, can I get some type of locking system for security and burglar resistance? 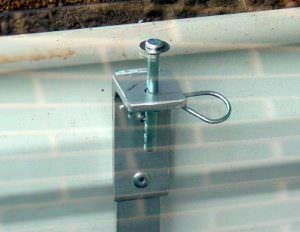 WindowWellExperts.com offer several options for locking, hinging, and/or propping open the window well cover. All of our window well covers are easily removable. From snap-on/snap-off clips (our most common option) to burglar resistant locks with quick release pin removable from inside to more deluxe systems with hinges and prop open devices. All are available options. Will the basement window well covers block the light into my basement? WindowWellExperts.com use CRYSTAL-CLEAR SEE-THROUGH Polycarbonate that allows in the same amount of light as a glass window, with the added strength and durability of Polycarbonate. With metal grate window well covers, the grid pattern of the grate does diffuse light with about a 20% reduction of light transmission. How long will the window well covers last? WindowWellExperts.com manufactures our “Unbreakable” clear plastic window well covers using special U.V. Formula to protect the covers for up to 15 years in direct sunlight against yellowing, fading, or becoming brittle. The metal grate window well covers are manufactured in aluminum to be lightweight and rust-free for a lifetime. Do you service, sell, and deliver window well covers to My Area, USA? WindowWellExperts.com has factory warehouses and representatives servicing all of the United States and can deliver anywhere in North America and Canada..
Are your window well covers safe for children, pets, and adults if they were to stand or fall on them? WindowWellExperts.com manufactures all Clear Plastic window well covers from “Unbreakable” type plastic known as Polycarbonate, also sometimes referred to as Lexan. These “Unbreakable” basement covers support up to 400 lbs. Our metal grate window well covers also support up to 400 lbs. 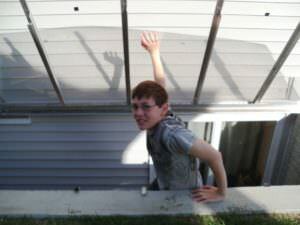 Do you have the right size window well cover to fit my basement window well and/or egress window well? WindowWellExperts.com has over 75 stock special sized tools and molds currently for window well covers that fit the most common sizes. If your wells do not fall into those size ranges we can make to order ANY SIZE Clear “Unbreakable” Plastic window well cover or metal grate window well cover. Since most of our products are custom fabricated to fit your individual needs, we first request information from you in order to provide an accurate quotation. Please give us a call at 1-888-650-9355 or fill out our Free Estimate form with your measurements to get a quote! Our Window Well Experts are available to take your call 24/7 at 1-888-650-9355. Or send us a message online by clicking here.